The towing bracket must comply with certain technical requirements. Your car is intended mainly for transporting passengers and luggage. However, if suitably equipped, it can also be used to tow a trailer or caravan. If the car is supplied with a factory-fitted towing bracket it will already have the necessary technical modifications and meet the statutory requirements. A 13-pin socket is provided to make the electrical connection between the car and the trailer. If the trailer has a 7-pin plug you can use an adapter cable. This is available from Audi dealers. If a towing bracket is retrofitted, the installation should be carried out by a qualified workshop. • In particular in high outside temperatures it is not possible to drive up long steep gradients without a suitable cooling system. The engine would then overheat. • Incorrect installation can result in a safety risk. Never exceed the maximum permitted trailer weights. If you do not load the trailer up to the maximum permitted trailer weight, you can then climb correspondingly steeper gradients. The maximum trailer weights listed are only applicable for altitudes up to 1000 m above sea level. With increasing altitude the engine power and therefore the car's climbing ability are impaired because of the reduced air density, so the maximum trailer weight has to be reduced accordingly. The weight of the car and trailer must be reduced by 10% for every further 1000 m (or part thereof). This figure refers to the combined weight of the (loaded) vehicle and (loaded) trailer. The figures for the draw bar weight that appear on the identification plate of the towing bracket are for certification purposes only. The correct figures for your specific vehicle, which may be lower than these figures for the towing bracket, are given in the registration documents. Also refer to. Distribute loads in the trailer so that heavy objects are as near to the axle as possible. Loads carried in the trailer must be secured to prevent them slipping. Where possible, operate the trailer with the maximum permitted draw bar weight on the ball joint of the towing bracket, but do not exceed the specified limit. Check the tyre pressures on your car and adjust for “full load” conditions (refer to the sticker listing the tyre pressures on the end face of the driver's door). It may also be necessary to adjust the tyre pressures on the trailer according to the recommendations of the trailer manufacturer. Check whether you can see enough of the road behind the trailer with the standard mirrors. If this is not the case you should have additional mirrors fitted. Both exterior mirrors should be mounted on hinged extension brackets. Adjust the mirrors to give sufficient vision to the rear. Before starting a journey, check the headlight beam settings with the trailer hitched up. If necessary, alter the height of the headlight beams by means of the headlight range control. When you remove the ignition key the power supply to the trailer is interrupted. Vehicles with a factory-fitted towing bracket are equipped with a removable ball joint coupling. It is carried under the floor panel on the left-hand side of the luggage compartment and is secured by a strap. We recommend having the car serviced between the normal inspection intervals if it used frequently for towing a trailer. Trailer stabilisation helps to reduce the risk of the vehicle skidding when towing a trailer. The trailer stabilisation system is operational only when the ESP is switched on and there is no malfunction in the ESP. When is the trailer stabilisation system activated? • The trailer connector must be properly secured in the vehicle socket. • Vehicle speed must be higher than approx. 60 km/h. In many cases, the driver can stabilise a swaying trailer by manually braking the vehicle. However, if the ESP detects that the trailer is swaying and this is affecting the towing vehicle, it will automatically brake the vehicle to stabilise the trailer by slowing it down. The warning lamp ö will light up in the instrument cluster. If possible, do not turn the steering wheel at this stage. In order to warn traffic behind you, the brake lights will come on during this automatic braking operation. A trailer weighing less than 70% of the kerb weight of the towing vehicle may sway quite considerably without the trailer stabilisation system intervening. This can happen when the swaying movements of the light-weight trailer are not or hardly passed on to the towing vehicle and are therefore not detected by the ESP. If the system for activating the trailer brake lights is defective, this will be indicated in the instrument cluster display, “Bulb monitor ”. If these conditions are not met in full, the trailer stabilisation system will only intervene to a limited extent or not at all ⇒ . • The electrical connection between the towing vehicle and the trailer must be functioning correctly, without any defects. • The load on the trailer must be properly secured. 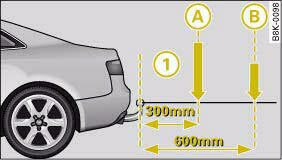 • The tyre pressures on both the vehicle and the trailer must be adapted to the load that is being carried. • Where possible, operate the trailer with the maximum permitted draw bar weight. • The trailer overrun brake must be set correctly. This is important to ensure that the trailer can be braked correctly, to avoid the vehicle and trailer “jack-knifing” and to prevent excess braking of the trailer. • At low outside temperatures, both the towing vehicle and the trailer should be fitted with winter tyres. It is essential that you adjust your speed to suit the weather, road and traffic conditions. Do not let the trailer stabilisation system tempt you into taking any risks when driving – this can cause accidents. • The ESP and trailer stabilisation system cannot defy the laws of physics. This should be kept in mind, particularly on slippery and wet roads and when towing a trailer with a light load. • The trailer stabilisation system is functional, regardless of whether the trailer has a mechanical overrun brake or not. • The trailer stabilisation system is not always able to detect swaying of trailers with a light load and will therefore not intervene. • A trailer can still “jack-knife” on slippery roads with little grip, even if the towing vehicle is equipped with the trailer stabilisation system. • Trailers with a high centre of gravity may even tip over before they start to sway sideways. Driving with a trailer always requires extra care. Try to avoid towing a loaded trailer with an unladen vehicle. If this cannot be avoided, drive extra slowly to allow for the unbalanced weight distribution. The stability of the car and trailer is reduced with increasing speed. For this reason it is advisable not to drive at the maximum permissible top speed in unfavourable road, weather or wind conditions. This applies especially on a downhill gradient. You should always reduce speed immediately if the trailer shows the slightest sign of swaying. Never try to stop the swaying by accelerating further. Always brake in good time. If the trailer has an overrun brake, apply the brakes gently at first and then firmly. This will prevent the jerking that can be caused by the trailer wheels locking. Change down in good time before going down a steep hill so that you can use the engine braking effect to slow down the vehicle. Swaying and pitching can be reduced by stabiliser aids. We recommend having stabiliser aids installed when towing trailers with a high trailer weight. They can be purchased and installed at an Audi dealer. When climbing long hills in hot weather with the engine running fast in low gear, you should keep an eye on the coolant temperature gauge. Reduce speed immediately if the needle moves to the top end of the scale. If the temperature warning lamp in the instrument cluster should start flashing, stop the car and let the engine cool down by running it at idling speed for a few minutes. Before mounting equipment and accessories (e.g. bicycle rack) please observe the following notes. The equipment/accessories mounted must not protrude more than 700 mm from the ball joint 1. The total weight (mounted equipment plus the load) must not exceed 75 kg. The maximum load depends on where the centre of gravity lies. The maximum weight decreases as the distance between the centre of gravity and the ball joint 1 increases. If the distance is 300 mm, the total weight (incl. the equipment mounted) must not exceed 75 kg. If the distance is 600 mm, the total weight (incl. the equipment mounted) must not exceed 35 kg. Only bicycle racks for a maximum of three bicycles may be used. We recommend that you only mount equipment (e.g. bicycle rack) which has been approved by Audi on the ball joint. If you wish to attach other equipment please make sure that it has been approved by the manufacturer for use on the ball joint. If you mount unsuitable equipment, this can cause damage to the towing bracket. In an extreme case, damage to the towing bracket could cause it to break ⇒ . • If you wish to mount equipment which has not been approved by Audi please ensure that it is suitable for use on Audi vehicles. • Use of unsuitable equipment can result in severe damage to the towing bracket. The towing bracket could then break while pulling a trailer and cause an accident.